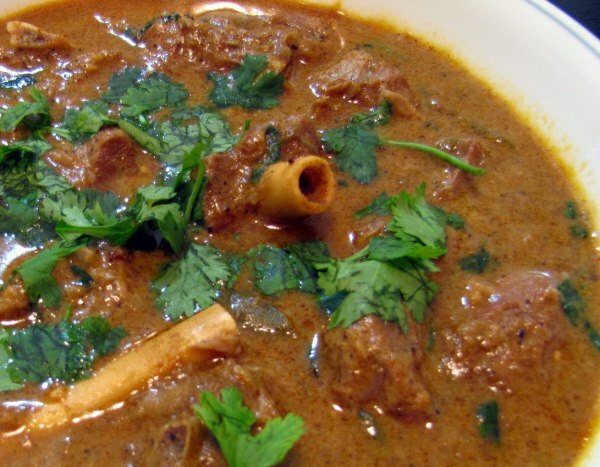 Boil the mutton in a pressure cooker with some salt and water. Keep aside after 3 whistles. Grind the mace, green cardamom, cinnamon, brown cardamom, black peppercorns and cumin seeds together making the garam masala. Heat 2 tsp of oil in a pan and lightly brown the onions with all the 4 whole red chillies.Add the ginger-garlic paste, coriander powder, turmeric powder, red chilli powder, garam masala and a dash of water. Stir and cook for a few mins. 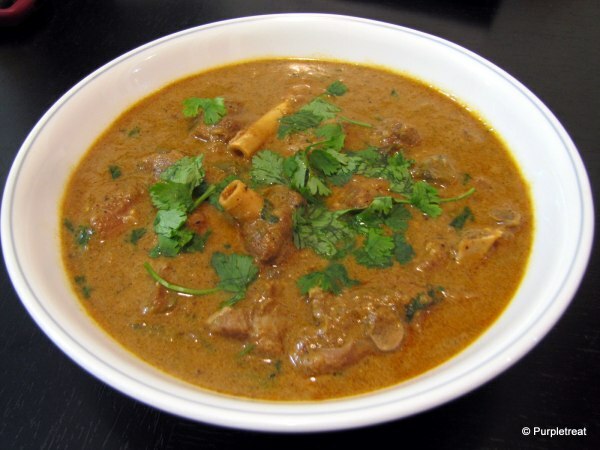 Pour the mutton stock in a bowl and add the mutton to the onion masala. Mix well.Now add the stock to the mutton and stir. Sprinkle some salt and add the curd.Add the crushed coriander (if using) and let it simmer for 30 minutes.